On the eve of the Civil War Sir Roger Mostyn (c.1568-1642) the head of the family lay dying in his bed. His heir and successor was his grandson, another Roger Mostyn (c.1623-90) who inherited the estate at the meagre age of eighteen. At this point, the Mostyns were one of the most influential gentry families in north Wales. Nevertheless, circumstances dictated that just as young Roger Mostyn inherited the estate the country was almost simultaneously being cast into the Civil War. It is clear that he had much to lose. Service to the English Crown in their localities of interest was important to the family and ancestral values virtually dictated that Roger Mostyn throw his whole weight behind the Royalist cause. During the course of the conflicts he was described as ‘a gentleman of good parts and mettle, of a very ancient family, large possessions and great interest in that country, so that in twelve hours he raised 1,500 men for the King and was well beloved there, living very nobly’. 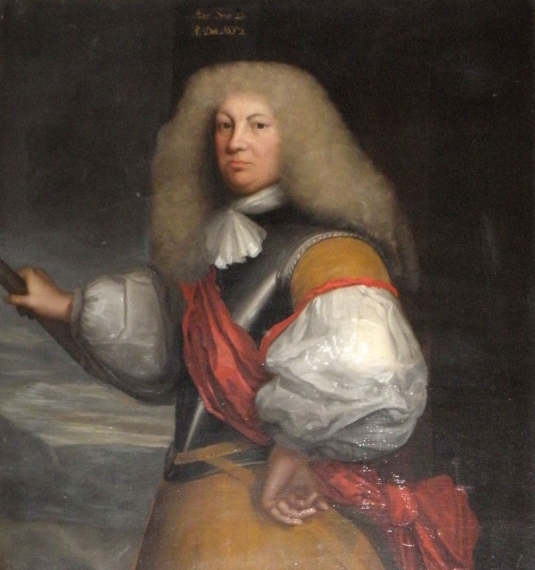 Following his involvement at the Battle of Edgehill, Colonel Roger Mostyn spent the majority of the campaign at Chester, also sailing on a recruitment mission to Ireland. He is most famous for his staunch defence of Flint castle, eventually surrendering it on honourable terms to the Parliamentary besiegers. At Mostyn hall there is a handkerchief which apparently bears the blood of the martyred King Charles I. Under the rule of Oliver Cromwell, Roger Mostyn, his estates and Mostyn hall were all saved from ruin by the intervention of Bulstrode Whitelocke, the brother of Roger Mostyn’s mother. Following the Restoration of the Monarchy in 1660, Roger Mostyn was knighted and made a baronet by Charles II for services rendered to the Crown.